We regularly talk to our clients to identify the biggest ecommerce pain points so we can build new features that help you succeed. One of the problem areas you tell us about over and over again is shipping and fulfillment. It’s complicated, it’s confusing, and many of you have to rely on third-party apps to get it done. To help simplify shipping, we’ve integrated with Endicia to offer real-time USPS quotes and easy label printing right from your control panel. We chose to partner with Endicia because they’ve been in the ecommerce shipping business for over 15 years and have printed more than $11 billion worth of postage in that time. We’re particularly happy to launch this new feature right before your fulfillment ramps for the holiday season. When it comes to shipping quotes, accuracy is vital for you and your customers. Endicia has been working closely with the US Postal Service since 1987, so their quotes are about as accurate as it gets. To enable the new USPS shipping services, choose a shipping zone from your Shipping Manager (Setup & Tools > Shipping) and click the Connect button for USPS by Endicia. If you already have an Endicia account, enter your credentials to connect. If not, you can quickly set up a no-fee account or opt for a paid account (more on that later). Now customers who select USPS shipping will get the most accurate quote available. You’ve always been able to print shipping labels for your Bigcommerce orders through various apps, but our new built-in integration with Endicia lets you print a label with a couple of clicks from your control panel. 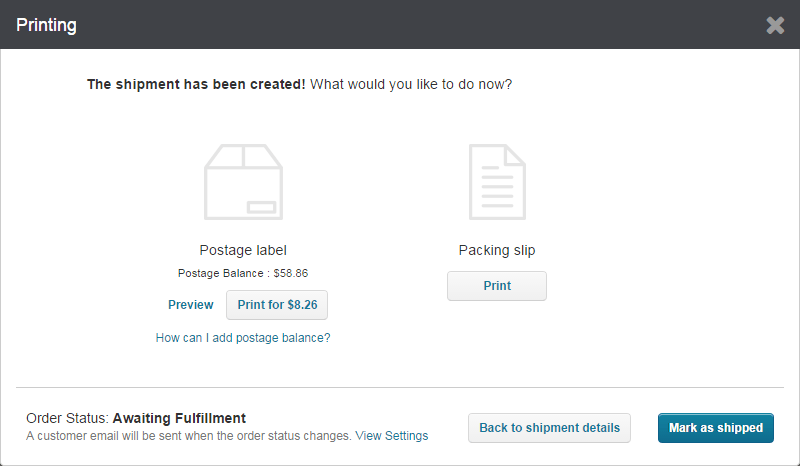 With USPS by Endicia enabled, go to your Orders screen and click Ship Items on an order. Click Ship, then Print. Boom! A window will open and you can print using your favorite postage printer. In addition to using a no-fee Endicia account to get real-time quotes and label printing, you can sign up for one of their subscription plans for access to exclusive postage discounts and more flexible shipping options. Plans start at just $15.95/month, which you can more than make up for in discounts if you have a decent volume of USPS orders. You can sign up or find out more on Endicia’s accounts page. For more information and detailed instructions, check out our Shipping with USPS knowledgebase article.